How to protect from and avoid ammonia exposure. Stay upwind of a spill or threatened release. Although ammonia vapors are lighter than air in some cases ammonia will hug the ground and drift. Ammonia has excellent warning properties which may allow escape before concentrations affect health. Many people can detect ammonia odor at 1 to 5 parts per million which is a hundred times less than what is immediately dangerous to life and health. Preplan your escape route prior to working near anhydrous ammonia. Carefully approach with the wind at your back or perpendicular to incident source. If ammonia vapors are drifting across a road, no vehicles should be permitted to drive into the cloud. Shelter in place or evacuate those residences down wind depending upon the expected ammonia air concentrations. Never wear contact lenses while working with ammonia. Use only ammonia rated goggles and gloves with the cuffs rolled up. For unknown concentrations use positive pressure (pressure demand) SCBA (self contained breathing apparatus). For concentrations to 250 ppm use NIOSH approved ammonia cartridge or any supplied air respirator. A full facepiece air purifying or air-supplied respirator will provide both eye and respiratory protection for concentrations < 250 ppm. 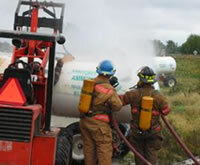 Structural fire fighting clothing can provide limited protection from anhydrous ammonia vapors provided it is during an outdoor release and the responders are using proper technique. Only firefighters trained in anhydrous ammonia response should be allowed to approach an ammonia release. The SCBA will provide eye and respiratory protection and the fire fighter's turnout gear will protect from skin exposure. Skin exposed through the openings around the pant legs and sleeves are usually enough to cause only slight skin irritation. Always keep the ear flaps down and the coat collar up as well as having manned water lines nearby and ready. Remember, structural fire fighting gear will NOT protect you from liquid ammonia. Under emergency conditions where contact with liquid ammonia or highly concentrated vapors is probable, chemically resistant, gastight totally encapsulating suits with positive pressure SCBA is required.